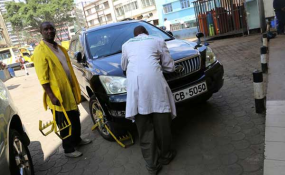 Nairobi City County attendants clamp a car whose owner had not paid for parking (file photo). Nairobi governor Mike Sonko's new daily parking rate of Sh200 has decreased revenues at City Hall. According to parking director Tom Tinega, the new rates have seen a dip in the department's revenues. "We have not increased the spaces and remember even at Sh300 we still had scarcity of space so the new rates have decreased the revenues," he said. "Some motorists are now parking on the yellow lines and there is a lot of chaos especially in the CBD," he added. Mr Tinega said the county government is "monitoring the situation to see if anything can be done." "I know that this (reducing the fees) will increase congestion in the city centre but then again, we cannot punish Nairobi residents because projects such as the Bus Rapid Transit (BRT) system and construction of bus termini outside the CBD are ongoing," he said. Parking revenue accounted for 18.6 per cent of Nairobi's Sh10.1 billion revenue for the year 2018 to June.